Yes, that is a thing! And they’re far simpler to make than you’d think. You just need a food processor, a sheet pan, a glass bowl, and a small pan. And of course, the desire for something perfectly pumpkin spiced and enrobed in dark chocolate. Are you feeling me here? 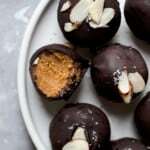 In fact, we even made a little video for you to show you just how easy these Pumpkin Pie Truffles really are. 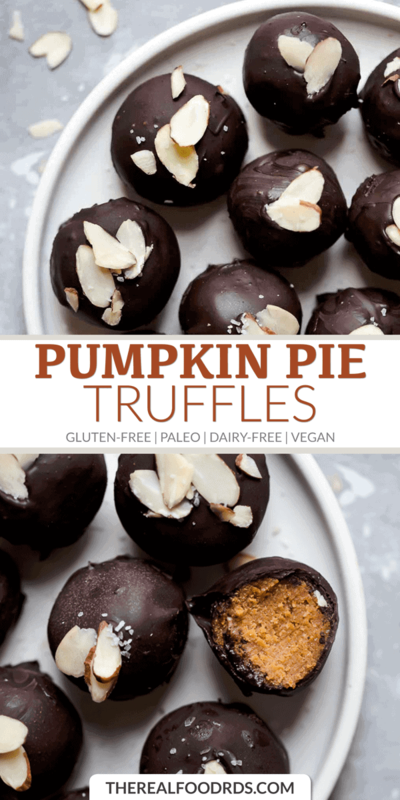 Okay, that’s a little weird, but I’m going with it because the filling of these sweet little pumpkin pie truffles is surprisingly not junky. In fact, it’s nowhere near junky what with the pumpkin (fiber, beta-carotene), almond butter (magnesium, vitamin E), coconut butter (fiber, medium chain fatty acids), coconut flour (more fiber), and just the tiniest amount of maple syrup (manganese, natural sweetener). 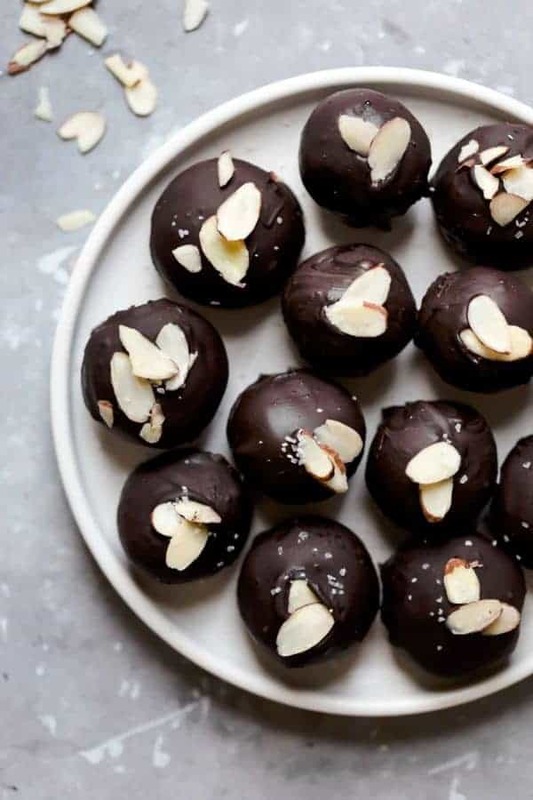 By replacing the usual chocolate and heavy cream-based ganache that you’d find in traditional truffles, we’ve made these plant-based and kept the overall sugar relatively low at just 3g per serving. And let’s not forget that pumpkin pie spice that makes everything nice, shall we? 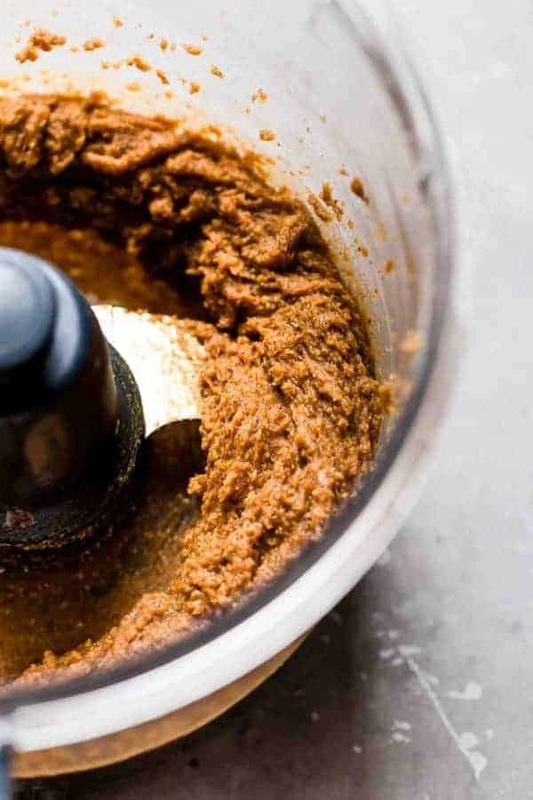 I used a premade pumpkin spice mixture, but if you don’t have any on hand, have a budget that won’t budge, or you’re just the DIY kind, then you can make your own using this recipe. Anyone who follows a diet that’s heavy on the whole, unprocessed foods (read: not a lot of sodium from packaged foods) will tell you that salt is the most amazing thing on the planet. It enhances everything it touches. 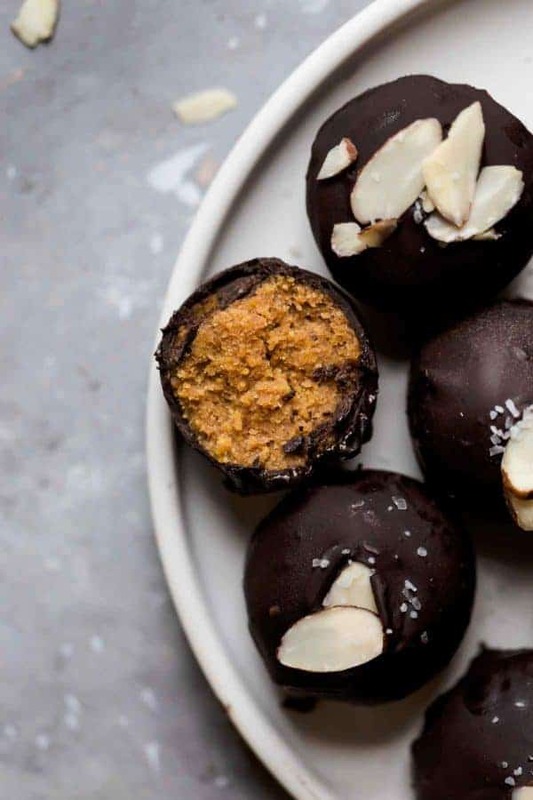 It makes flavors pop and pairs so beautifully with just about anything sweet, which is why these pumpkin pie truffles got a little sprinkle of coarse salt before adding a few crunchy sliced almonds. In a word, or two, they’re pumpkin-y perfection. Wouldn’t you agree? Looking for more delicious and healthier-for-you pumpkin recipes? Check out our Soft Gluten-Free Pumpkin Cookies with Cream Cheese Frosting, Pumpkin Spice Butter Coffee, Slow Cooker Pumpkin Chili, Paleo Pumpkin Spice Protein Waffles, Pumpkin Spice Protein Bars, No-Bake Pumpkin Chocolate Chip Granola Bars, or our No-Bake Pumpkin Cheesecake Parfaits. 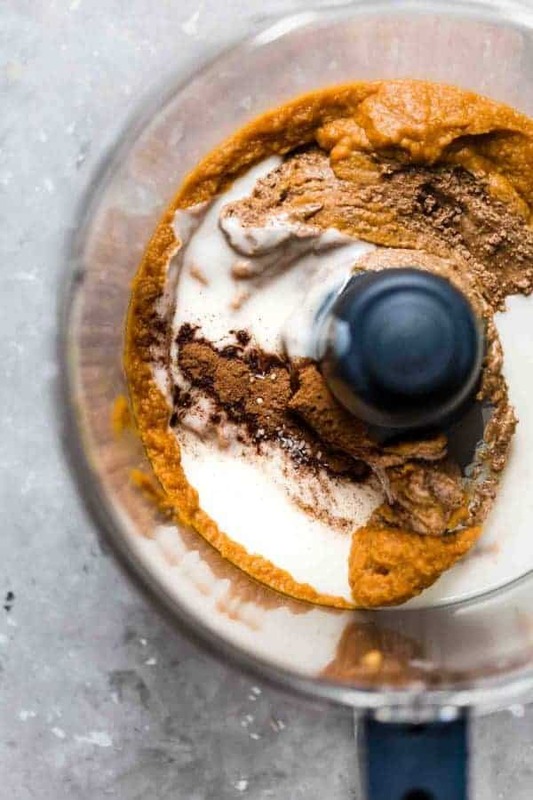 Place almond butter, pumpkin puree, coconut butter, maple syrup and pie spice in the bowl of a food processor. Process until smooth, stopping to scrape down sides as needed. Stop processor and add coconut flour. Process until a soft dough forms. If dough is too sticky, add 1-2 tsp. of additional coconut flour. Roll dough between your palms to form 12 equal-sized balls. Place on a plate in the fridge and allow to chill at least 30 minutes. When ready to dip, place chocolate chips and coconut oil in a glass bowl set over a pan of simmering water to simulate a double boiler. Stir occasionally until completely melted and smooth. 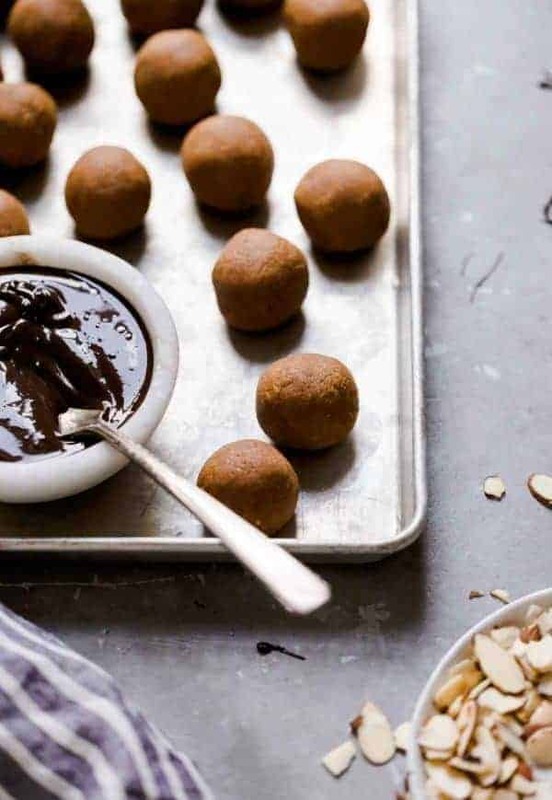 Using a fork or wooden skewer, carefully dip truffles one at a time into the melted chocolate, rolling and dunking until evenly coated on all sides. Sprinkle with chopped almonds, salt, and additional pumpkin pie spice, if desired. Transfer to a parchment paper-lined baking sheet and return to the fridge until chocolate hardens. Store truffles in a covered container in the fridge for up to 2 weeks. The texture is best when they’ve been allowed to sit at room temperature for 15-20 minutes before serving. 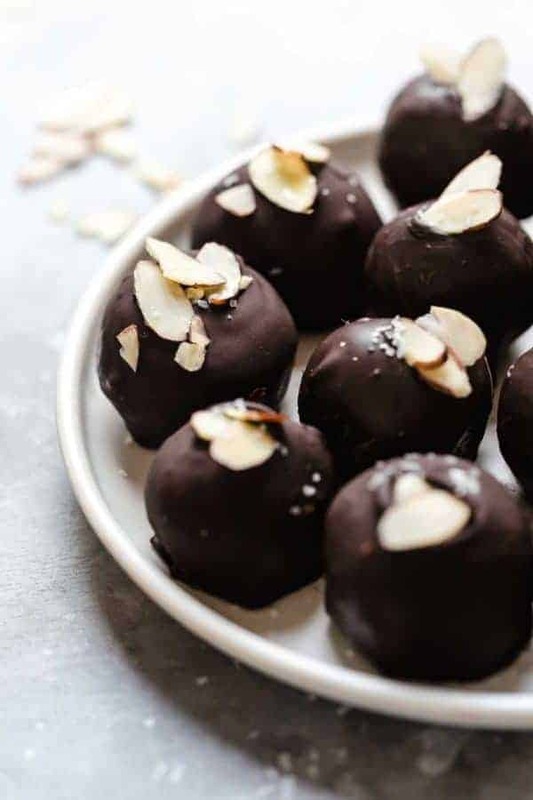 Pumpkin Pie Truffles will keep in a covered container in the fridge for up to 2 weeks and can be frozen for longer storage making them a great make-ahead option for a holiday feast, cookie exchange, or teacher gift. Have you made these yet? I’d love to hear what you think in the comments below. Can you sub in coconut oil for the coconut butter? I happen to have CO on hand but no CB. Yes, you can. They will be a bit after and you may need a touch more coconut flour depending on how wet your pumpkin purée is. Thanks! A bit what, though? Is there a word missing there? Sorry! Responding from my phone…a bit softer. So roll quickly and chill a bit longer before dipping. 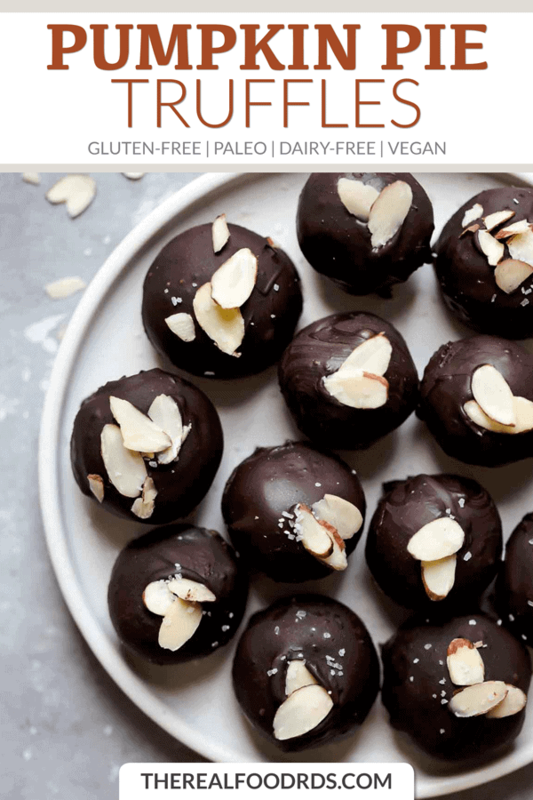 These look amazing but a coconut allergy…thoughts on good substitutions? Thanks so much! Unfortunately, I’ve not tried making them without the coconut flour or coconut butter so I can say for sure what would be the best substitutes. My guess is that you could use more nut butter (or even tahini) in place of the coconut butter and use almond flour in place of the coconut flour (though you may have to use more since it won’t soak up as much moisture). You’ll have to play with it a bit to get a texture that allows you to roll the mixture into balls that can then be dipped in chocolate. I have almond allergy, will it be fine to double the coconut butter for almond butter substitution? I’ve not tried swapping extra coconut butter for the almond butter so I can’t say what the texture would be like – however, I have used other nut butters (pecan or cashew) and even sunflower seed butter with good results. If you use more coconut butter, I’d love to hear how they turned out. Hi! Do you think I could add more pumpkin in place of the coconut butter? These look amazing! Thank you. So sad, these were terrible. Probably the worst healthy recipe I’ve ever made. I’m sorry to hear that this recipe didn’t work out for you. Did you have a particular problem with the recipe itself, i.e. mixture did not hold together, too sweet, etc? Or were they just not to your liking? For some reason i get obsessed with pumpkin around this time of the year. I’ll consume anything with pumpkin but you just combined with my favorite thing in the world, CHOCOLATE! I’ll be trying this recipe out soon. maybe for my cheat day because I know i won’t be able to control myself! We’re with you when it comes to pumpkin + dark chocolate! These do keep well in the freezer in case you want to stash some away for another day, too. Enjoy! I am excited to try these! I am wondering if blanched almond flour would work? I am just wanting options. :). I do have coconut flour as well, but love the flavor and texture of almond flour. Your thoughts? You could try the almond flour but it won’t absorb liquid as coconut flour does so you might have to use more flour to get them to stick together without being too sticky and you may need to keep them in the fridge or freezer. I made them with the coconut flour as directed. They were DELICIOUS. And guess what some of my friends and co-workers will be getting for Christmas this year? ;). Thank you for a wonderful recipe. I’m so glad you enjoyed them – you have some very lucky co-workers! I’m using this recipe for a school project and I haven’t even started! I’m supposed to bring in the food from the recipe for extra credit, but I’m glad I still have the recipe If I want to make them. They are really good if you use sweet potato in instead of squash. I happened to have sweet potatoes on hand one day and not squash so made them that way. Oooooo…we’ll have to try them with sweet potato next time we make them! Thanks for sharing!